No impact and lots of community keep swimmers healthy in body and mind. Sure, it’s important to stay fit, but what kind of exercise should you be doing as you grow older? Running jars bones and joints. Leg presses and crunches can injure your back. Lifting weights straight overhead, like in a military press or dumbbell press, stresses the shoulders and rotator cuff tendons. So how about swimming? It’s a good cardiovascular exercise. The buoyancy of water helps limit injuries. And a recent study suggests swimming is the only type of exercise that actually lowers older adults’ risk of falls. Researchers in Australia looked at 1,700 men ages 70 and older, and compared the types of exercise they did with their likelihood of experiencing a fall over a four-year period. Turns out the men in the study who swam were 33 percent less likely to fall. “Swimming is an all-body sport, and you’re going against the element of water. You’ve got friction,” says Kathy Coffin-Sheard, a swimming instructor at the Grand Traverse Bay YMCA, in Traverse City. Sleeping in, maybe? The first group hits the water at 5:30 a.m. Another group comes in at 8 a.m., and a third at noon, so swimmers can find a group that suits their schedule. It isn’t simply an opportunity to come in and splash around and maybe swim a few laps. Swimmers arrive ready to learn, work on their form, and stretch their muscles and capabilities. Besides the camaraderie and the health benefits, senior swimmers are also motivated by competition—against others and against the clock. Harriet Wall is 75 and competes in swim meets. “She swims three hours a day, 1,500 miles a year,” Coffin-Sheard says. Bearup also pushes herself to be her best—likely a lifelong result of being an athlete at the University of Michigan. “Anytime you can do something that challenges you, it’s a great thing,” says Coffin-Sheard. And she’s infused her acolytes with that spirit: 15 of her swimmers are going to the U.S. Masters Championships in Indiana in May. So you’ve decided to take up swimming for exercise. How and where should you start? Here are a few tips. It sounds intuitive, and to a degree it is. You need a swimsuit, but you want to make sure it’s good quality, provides the support you need and is comfortable and durable. The same rules about good fit are true for goggles, which protect your eyes and help you see everything more clearly. Like suits, it may take some time to find goggles that are snug yet comfortable. Several manufacturers now make prescription goggles. 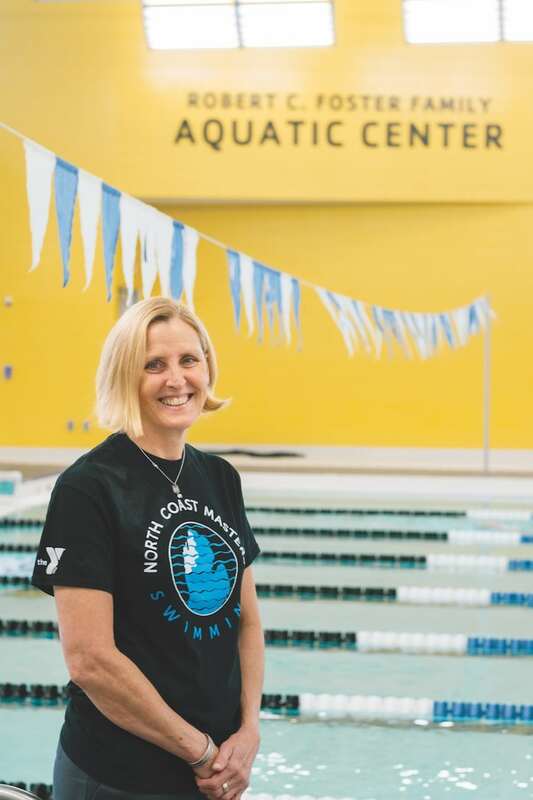 “Don’t do too much at first,” warns YMCA coach Kathy Coffin-Sheard, noting you could injure yourself or burn out. Build your routine slowly. Start with a couple of days a week and gradually increase. Likewise, take it easy when increasing your swimming distance. Consider using the “10 percent” figure that runners often use as a guideline—don’t increase your distance by more than 10 percent a week. Use “gradual” as your byword to avoid injury and build confidence and stamina. If you swim with others, you’ll find encouragement and camaraderie. Taking an Adult Learn to Swim class will provide the fundamentals. “We offer small group and private lessons,” says Coffin-Sheard. She says for some people, the hardest part is putting on their swimsuit and coming out of the locker room. “Swimming takes longer to adapt to than any other sport,” Gerry Rodrigues, a Los Angeles–based swim instructor, told the cancer-fighting organization Livestrong. Even if you’re a marathon runner or have logged hours on the stair-climber, you have to acclimate to the new breathing pattern swimming requires.